Be careful. The Park Service Rangers get a little testy when you call it the Klondike Gold Rush National Historic Park and not the Klondike Gold Rush National HistoricAL Park. A lot of museums offer watered-down versions of real life. Sure, they have various displays that catalog historical events or feature artistic achievements but they lack the flavor that makes life truly engaging. There are numerous museums in Skagway that highlight events surrounding The Klondike Gold Rush but after a while, they all start looking the same. Stampeders, a ton of goods, Chilkoot Trail, White Pass train, Robert Service, yadda yadda yadda. Most Skagway museums turn the exciting Gold Rush into nothing more than a boring high school history class, but Jeff. 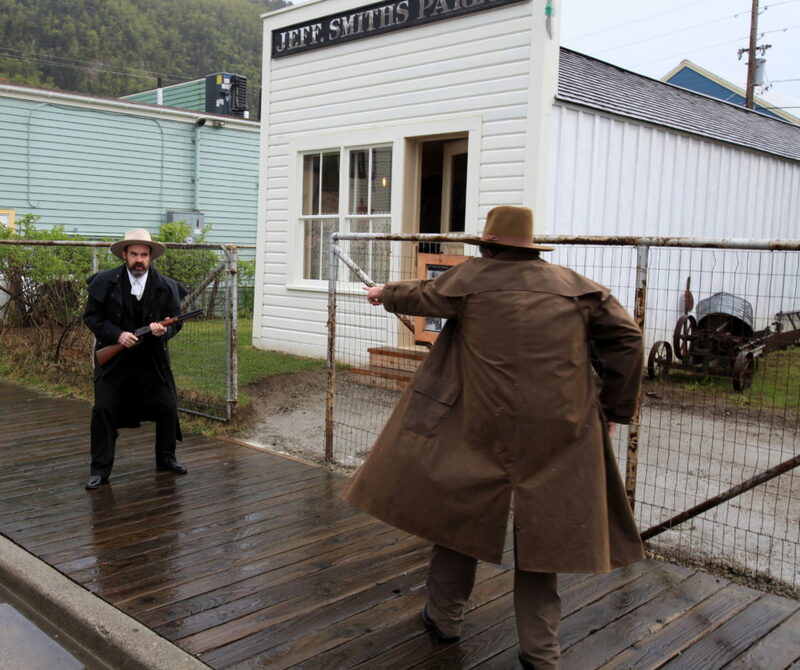 Smiths Parlor Museum offers some authentic Skagway flair that will have you smiling with glee. Jeff. Smiths Parlor Museum is run by the park – surprise! By this, the fourth week of our Skagway museum series, you should already know that the Klondike Gold Rush National HistoricAL Park has a museum on just about every block in town. A few years ago they announced that they were restoring Jeff Smiths Parlor and were turning it into another museum. I figured it was going to be yet another museum about the harsh conditions of the Trail of ’98 or some other such retread, but I couldn’t have been more wrong or pleasantly surprised. Jeff. Smiths Parlor Museum is filled with oddities and historical tidbits that provide insight into the quirky culture of a 19th Century Alaska boomtown. There are items from the Gold Rush and post-Gold Rush that hint at the mystery and adventure of Skagway’s early days. If you want a taste of real northern living, this is the do-not-miss museum of Skagway. What’s the deal with the period after Jeff.? If you notice, the name of the museum, Jeff. Smiths Parlor Museum is spelled kind of weird. There is that odd period after “Jeff,” that doesn’t make much sense. Plus “Smiths” is possessive so it should have an apostrophe. My best guess on the period is that it was added to show that “Jeff” is short for “Jefferson.” But the lack of an apostrophe is really annoying and makes me think “Soapy” Smith was either kind of dumb or hired the wrong sign maker. What kind of stuff is in the museum? All sorts of weird items. There’s a creepy looking mannequin of Soapy Smith at the bar. There is another mannequin of what could be a bigfoot wearing a suit and train conductor’s hat. There is a mountain sheep head with glowing light bulbs for eyes and another sheep skull with feet where its face should be. You can see a deformed moose head mount with evil red eyes and a bunch of casino gambling equipment from the Gold Rush. There are also countless newspaper clippings on the walls that offer a glimpse into the day-to-day lives of those wacky gold seekers from 1898. Have you ever wondered what would happen if two rutting moose interlocked horns and couldn’t manage to free themselves? Well, this is your lucky day. I don’t know about you, but I much prefer to see a bunch of weird crap rather than a sterile diorama display with a bunch of recreated historical nonsense. That’s why I like the Jeff. Smiths Parlor Museum. To get the full effect, be sure to check out the museum across the street, the Red Onion Brothel Museum, which will be featured in next Sunday’s blog.